By Eric Thomas: Trainer Naazim Richardson believes that Shane Mosley, fighting at his best, will give WBO welterweight champion Manny Pacquiao all he can handle this Saturday night when they mix it up at the MGM Grand in Las Vegas, Nevada. Richardson feels that Mosley can make the needed adjustments to beat Pacquiao and shock the world. Few boxing fans see Mosley winning, but Richardson has spotted a number of flaws in Pacquiao’s game and feels that Mosley can exploit these flaws to get a big upset win. Richardson has a good point. 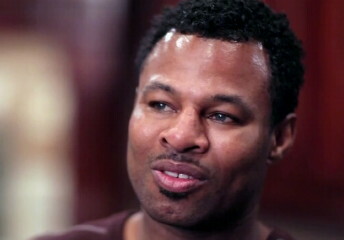 Mosley is the bigger fighter, and has more experience against quality fighters than Pacquiao. If Mosley can fight at his best level, he could pull off a big upset on Saturday and help set himself up for a big money rematch later on in the year. For Mosley, it would be a fairy tail ending for his long career. It was thought last year that Mosley’s chances of getting big paydays were about finished when he was easily beaten by Floyd Mayweather Jr. However, Mosley was given the chance against Pacquiao that many fighters could only dream of. Two years before, Mosley couldn’t get a fight with Pacquiao when Mosley was a champion. Freddie Roach, the trainer for Pacquiao, sees a lot of flaws in Mosley’s game that he thinks that Pacquiao can take advantage of to get a knockout win. Roach wants the knockout so that it can make more noise for Pacquiao. With him fighting a guy as old as Mosley, it almost requires a knockout for the fight to really register in the boxing world because of Mosley’s long stretch where he’s been winless.